Taking on Mandevilla and Dipladenia once again, and what to do during the winter; also the same question for dwarf Alberta spruce. 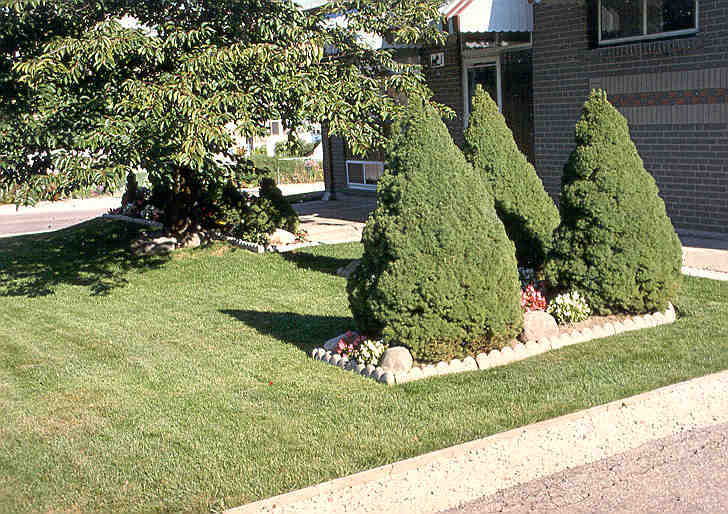 All of the dwarf Alberta spruce in these photos are growing in central East York, part of the GTA. 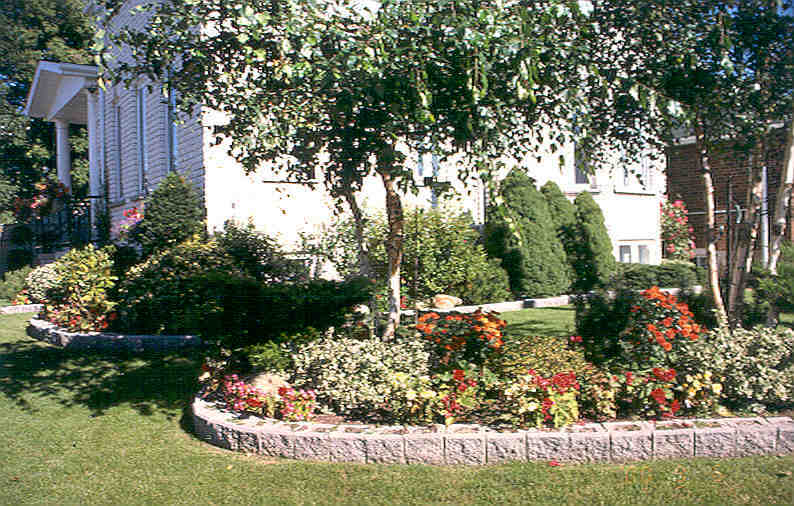 The top two are just about perfectly-sized specimens on a typical narrow lot; in the middle shot (three great plants located between the two white birch) on a large lot, look just about perfect in their raised bed; the bottom shot is of three lovely, larger plants on a medium-sized lot, but unfortunately the owner chose to place the artificial stone edging around the planting bed! Twice last week I was asked about the exotic evergreen climbing vine (often called a shrub) Mandevilla (Brazilian jasmine). When I get asked about this plant I like to point out that there is continuing confusion about it (there at least four distinct varieties, but the most popular in Ontario seems to be ‘Alice Dupont’ with bright pink flowers), because there is another plant--Dipladenia--with similar attributes. Botanically, many growers are now ‘buying’ the latest botanical re-classification, which puts all the former plants known as Dipladenia into the genus Mandevilla. Suffice it to say, there are certainly a few differences between the two plants. Mandevilla is usually found grown on a trellis in a pot. Dipladenia is more likely to be sold as a small potted plant without a trellis. The flowers of Mandevilla are generally larger, and the leaves, also larger and much longer than wide, are not as leathery but quite rough in texture. Dipladenia, on the other hand, has smaller somewhat heart-shaped leaves that are smooth and quite leathery. Mandevilla's also show a tendency to vine more. Having said all that, the question usually is what to do with them over the winter. Tropical plants in our temperate gardens have greatly increased in popularity in the last decade. It is a shame to toss them in the compost pile or garbage bin each year. Lantana, Fuchsia standards, potato vines, standard roses, passion vines, Mandevilla and Dipladenia may all be over-wintered in a cool basement room or equivalent. In my Toronto basement cool plant room we supplied the light from a couple of 48” fluorescent tubes overhead, on for about 14 hours a day. With most of these, particularly Mandevilla, it is important that they be kept almost totally dry for the winter months. Generally, the cooler the temperature without freezing, the better. In late February or March, move them to a brighter position, and when growth recommences, water more frequently, and include a soluble fertilizer (20-20-20 at first then a 15-30-15). Dipladenia (a somewhat different plant, contrary to what has been said over and over in other media) is better wintered at around 20o C in a sunny window. And, incidentally, one inquiry to the ICanGarden site last week asked a similar question, but the inquirer said she had cut the Mandevilla down to about 30 cm. I would suggest that is NOT necessary. I don’t believe there is one answer to this question. I will deal first with the one part of her question to which there is a definite answer--no, Stella should not bring hardy plants such as these inside for the winter. That is not an option. I’ve been watching the ‘performance’ of dwarf Alberta spruce (Picea glauca ‘Conica’) in southern Ontario for over 40 years! In my early days at Sheridan Nurseries we wrapped our large specimens on their southwest sides for the period from early January to mid March because we knew if there was to be any scorching from the sun, that is when it would occur. In the 90s I observed countless numbers of these in both medium and large sizes, planted in various parts of East York as I judged the gardens there. No wrapping was done. 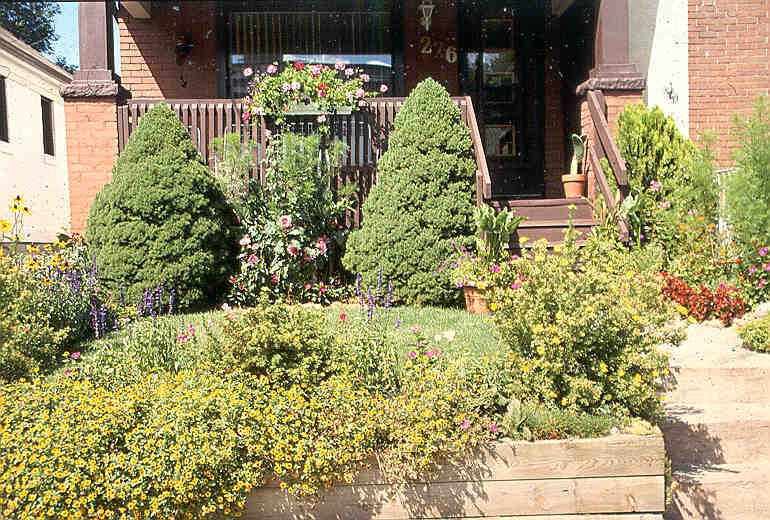 One house on Wolverton Avenue had a beautiful hedge of dwarf spruce plants about 75 cm (30”) high all around the front lawn of the property, which faced west. You should be able to tell how impressed I was with them that I can remember one house out of the thousand I looked at each year. But that was heavily urbanized East York. I wonder how open and subject to drying winds Stella’s porch really is. One option, which I think I favour for this year, would be to dig holes to accommodate the entire pot of each in a part of the garden that is at least partly shaded. The soil around each pot should be filled in reasonably firmly. I would not think, under this regimen there would be any need to wrap them. But, if you happen to get a bright, sunny period in late January or February, it would be wise to check them and if you see any signs of drying needles, cover them with a sheet of burlap. It need not stay on past the middle of March. Another option may be putting them in a garage as soon as the weather turns bad, and removing them in mid March. That would only be a possibility if it is an unheated garage and you do not leave a car running in the garage at any time. Do let me know what you do, and how it turns out!